Vi Hart (a full-time mathemusician at Khan Academy) makes mostly short YouTube videos on a variety of mostly math and science subjects. She draws in a notebook while talking really fast, making insightful, surprising connections. She’s smart, funny, knowledgeable, and entertaining. This brilliant video is, I think, a bit of a departure: a 30-minute piece explaining how 12-tone music works. Because of copyright law, she can’t play Stravinsky and Schoenberg, so she composes her own 12-tone versions of well-known tunes, with side-journeys into pattern recognition and the nature of art. By the end, she’s composed a four-part, 12-tone vocal version of “Mary Had a Little Lamb” that she sings herself. It’s a tour de force of music, science, art, and explanation. I watched Phil Ochs: There But for Fortune, a 2010 documentary about the uncompromising and ultimately troubled protest singer, Phil Ochs. He was later robbed in Dar es Salaam, in a strangulation attack that damaged his vocal cords and which he thought may have been planned by the CIA. Later that year, Allende was overthrown (CIA, again) and his friend Jara was tortured and killed, and this seemed to trigger a psychological break that resulted in heavy drinking, a personality change, and eventually death by his own hand. As a movie, it’s a well-done documentary (by his brother, Michael Ochs) with lots of footage from the news of the time and words from many of the usual suspects: Pete Seeger, Joan Baez, Tom Hayden, Abbie Hoffman, Jerry Rubin, Paul Krassner (who has not aged well), and Ochs’s daughter, Meegan, who gives Ochs some redemption. In addition, Jello Biafra, Christopher Hitchens, Sean Penn, and Billy Bragg show up to say pithy things for largely unknown reasons. Bragg is al least his moral descendent, and Biafra covered Ochs’s cynical “Love Me, I’m a Liberal,” and only made a few changes to make it current. 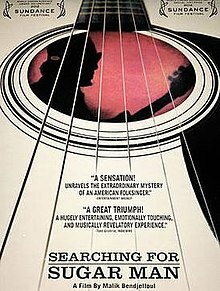 While the Academy Awards show played, I decided to skip it and watch Searching for Sugar Man, a marvelous film that I later learned won an Oscar for best documentary. The movie is about the musician Sixto Rodriguez, who made only two albums, in 1970 and 1971. Though the songs were great, and the people behind the album were top-notch, Rodriguez failed to catch on nationally and eventually left the music business, working manual labor jobs in Detroit. Meanwhile, in South Africa, records and tapes of Rodriguez’s songs became among the most-played music of a generation. More popular than Bob Dylan, the Rolling Stones, the Doors, or anyone else of that time, Rodriguez got played at every party and gathering. His songs often contained themes typical for the time, commenting on social issues and the evils of “the establishment” — themes that resonated greatly with the youth of South Africa, which was at the height of apartheid. The government (especially under P.W. Botha) violently suppressed political statements and controlled the media, and SA resembled a police state, with little news coming in or out. Because of this, no one in South Africa could learn anything about Rodriguez, and most believed that he had died luridly, killing himself onstage, either with a gun or in flames. In addition, Rodriguez never knew that a generation of a whole country had his music as their soundtrack. Eventually, in the ’90s, a journalist in SA decides to learn how he really died, and eventually discovers he hasn’t, and that he lives (seemingly contentedly) at poverty level in gritty Detroit. The movie becomes practically a fairy-tale: Rodriguez comes to South Africa for a series of triumphant concerts, comfortable playing onstage in a large venue to screaming fans despite the years of downtime. And, we learn at the end, he is completely unchanged by the experience. A postscript tells us he gave away most of the money he’d earned, though he continues to visit and perform SA — one of his daughters even met, married, and had a child with a musician she’d met on the first trip there. The movie itself is well-shot — amazingly on 8mm and iPhone — with subtly animated sections and B-roll helping to piece together the contexts of Detroit and Cape Town, and the interview sections are terrific: there’s the enthusiastic South Africans, the perplexed and nostalgiac US record company pros, the dumbfounded (and surprisingly philosophical) coworkers, the grateful if wary daughters, and Rodriguez himself, unsure what to do with all the attention but genuinely happy while it lasts. Charlie knew Woody well enough to report riding trains with him, though they were 19 years apart. When Woody printed this in 1945, Charlie was 13 or 14. He left home a few years later, so I suspect it was 1949 or later when their lives intersected. Anyway, I'm glad to have this little slice of time. Happy 100th birthday, Woody. My father-in-law Charlie Weiner died on Saturday. He was 80, and having an extended stay in the village of Eyeries, Ireland with his wife, JoAnn Hughes. Charlie was a remarkable guy, and I'm deeply sad that I won't get to spend more time with him. We only met in 2007, a few months after I met his daughter, Susan Weiner. I liked him immediately – he was funny, and engaging, and a great person to have a conversation with, because he loved to hear and share stories. He grew up in the Flatbush section of Brooklyn. In 1946, he hit the road to explore the South with a friend. Among his better documented stories is his encounter with Fiddlin' Bill Hensley, an old-time musician he searched out who lived in a ramshackle cabin near Asheville, North Carolina. This was the beginning of a lifelong obsession with music, and Charlie's music experiences ranged from New York jazz clubs to Gullah singers in the Georgia Sea Islands. He had a great ear and memory for melody – at 80, he could still sing Japanese songs he'd learned in Tokyo during his brief military career in the '50s. In the late '40s he rode the rails and played songs with Woody Guthrie, who gave him one of his hand-drawn, mimeographed songbooks. He attended get-togethers at Pete Seeger's Greenwich Village home, and was present the night Lee Hays brought over his friend Ronnie Gilbert and the Weavers were born. Charlie acted as impromptu security for Paul Robeson and other musicians as the 1949 civil rights and music festival in Peekskill, New York deteriorated into a racist and anti-Semitic riot. His mother was a socialist who ran for office in New York, and Charlie remained a staunch supporter of those ideals his entire life. He distrusted and questioned authority, and always fought for basic human rights. In the '50s, he spent time in auto plants in Ohio, working on the line but secretly organizing for the union. He took part in civil rights marches in New York and Washington DC, and Susan got to see Martin Luther King when she was a young girl. He worked on campaigns for Henry Wallace, Eugene McCarthy, and George McGovern. He met his first wife, Shirley Marks, in Cleveland, and they brought forth Susan Weiner, my wife. Their marriage didn't last, but he and Shirley remained cordial friends until the end. Charlie entered college at Case Institute of Technology, eventually earning a PhD in the History of Science and Technology in 1965, the subject that became the focus of the rest of his life. From 1965 to 1974 he was director of the Center for History of Physics at the American Institute of Physics in New York, where he applied his earlier interests in talking to people and recording the results. In 1970, he used a Guggenheim Fellowship to move his family to Copenhagen so he could document the life of Niels Bohr, and many of his oral histories, films, and papers can be found online in AIP's Niels Bohr Library. In 1975, he joined MIT as professor of History of Science and Technology, and was founding director of the MIT Oral History Program until 1986. He was a visiting professor at UC Berkeley, a Fellow of the American Association for the Advancement of Science, and, in 2002, he was named the Arthur Miller Lecturer on Science and Ethics at MIT. His work collecting interviews, letters, and other papers resulted in four books: Exploring the History of Nuclear Physics, History of Twentieth Century Physics, The Legacy of George Ellery Hale (with Helen Wright and Joan Warnow), and Robert Oppenheimer: Letters and Recollections (with Alice Kimball Smith). This doesn't include the many interviews with prominent scientists Charlie made available to others. Notably, his interviews with Richard Feynman – the first time the famous physicist had agreed to discuss his work – were quoted and credited in James Gleick's Genius: The Life and Science of Richard Feynman. Charlie never left behind his great love of music. Though he lived in Cape Cod with JoAnn, his wife and partner of many years, he kept a Greenwich Village apartment so he could see live jazz in the many clubs where he was well known to everyone from the owners and staff to musicians. Among his close friends, he counted guitarist Jim Hall (who gave him guitar lessons), trombonist Roswell Rudd, and pianist Bruce Barth, but the many, many people Charlie loved and who loved him back may be numberless. In February 2010, Susan and I came to Cape Cod, because Charlie had landed in the hospital with congestive heart failure (which continued to plague him for the next two years). It was not entirely a sad trip for us, as he was able to come home and he and JoAnn toasted our Valentine's Day engagement, which had occurred in the restaurant across from their home. By July, Charlie was healthy enough to come to California for Susan's birthday and he and JoAnn came to our wedding in October. In December of 2010, Charlie and JoAnn had a long stay in Eyeries, a small village on the Beara Peninsula in southwest Ireland, so JoAnn could work on her art and Charlie could work on his book. Originally planned for three months, they had such a good time they extended their visit by another month. The people there welcomed them completely, and they made many friends. On their return home, Charlie played us recordings he made of community music sessions held in a nearby pub – a long and terribly sad song sung a cappella by an angelic-voiced young teen was a standout. They returned to Ireland a year later. Despite misgivings about his health, Charlie was the biggest champion of the trip and refused to stay home. He looked forward to seeing his new friends and diving back into the book, where he'd done his most productive work in some time. After arriving in Eyeries, however, he never fully recovered his strength, and declined rapidly. He is missed tremendously by all who knew him, and the idea that the world goes on without him – and his continuous, shameless puns – is hard to imagine. Sláinte and l'chaim, Charlie, we'll sing a song for you in loving memory. Eating out with Charlie meant enduring a ritual of joking banter with the waiter or waitress, who had to endure a pop quiz of their menu. "So, tell me, the sole — is that sauteed in oil or just how is it prepared?" As much as he enjoyed finding new restaurants he loved sharing his favorites with his friends. UPDATE 2: Thanks to all the visitors who are leaving personal remembrances of Charlie. They mean a lot to his family, and help reveal a side of Charlie we didn't know directly. It is quite moving to hear the impact he had on others. Please encourage others! MIT has published its official obituary. UPDATE 3: Will Thomas says kind things about this post and writes about oral history and the extent and importance of Charlie's work on the history of science blog Ether Wave Propaganda. Just love this: 14 J.S. Bach canons of increasing complexity built around the first eight fundamenta notes of the Goldberg Variations, lovingly displayed in an animation that both translates Bach's original manuscript page into English and readable notation and explains how Bach mirrored, inverted, repeated, and otherwise made his melody lines sit up and do tricks. Here's another short film on craft and passion, OurGlass of Cockington, marvelously filmed by Danny Cooke (who did the short on David Smith, ornamental glass blower, I'd blogged earlier). OurGlass of Cockington are a trio of glassblowers, a practice that demands quick work and complete concentration. Cooke captures the beautiful details of their art, from the intense fires to the molten glass to the hands of the artists, which are always in motion, spinning, swinging, cutting, and more. There's a wonderful choreography, as they seem to work instinctively and silently together. I also enjoyed the soundtrack by Tony Higgins, and the village of Cockington in Torquay looks worth a visit. Hoooooyeah, The Heavy, baby. Stay to the end to see Letterman do something he’s apparently never done before: ask for more.